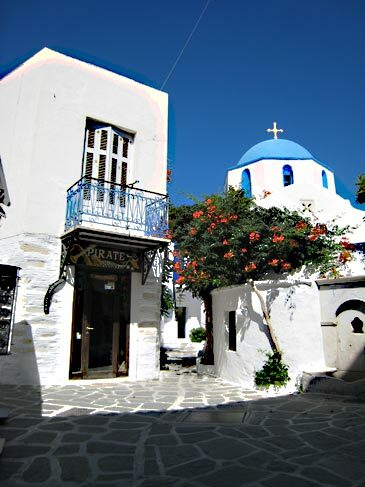 The old town of Paroikia is one of the most captivating in the Cyclades, easily rivalling Mykonos in charm but with far less noise and exhibitionism. Separated from the sea by the steep sides of the Venetian Castro, it has good shops, restaurants, tavernas and some quite lively night-life. Across the capital’s wide bay are sandy beaches reached by caique in a few minutes, but fine beaches abound all round the island, (good windsurfing on the SE corner) and all served by bus. 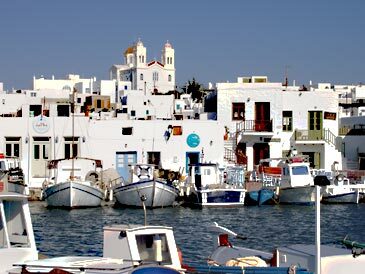 The tiny harbour of Naoussa in the north is worth a visit, despite its surrounding sprawl containing most of Paros’s modest collection of Martians. West from Naoussa is a sheltered bay on whose far side at Kolimbithres you will find smooth rocks reminiscent of the Costa Smeralda. 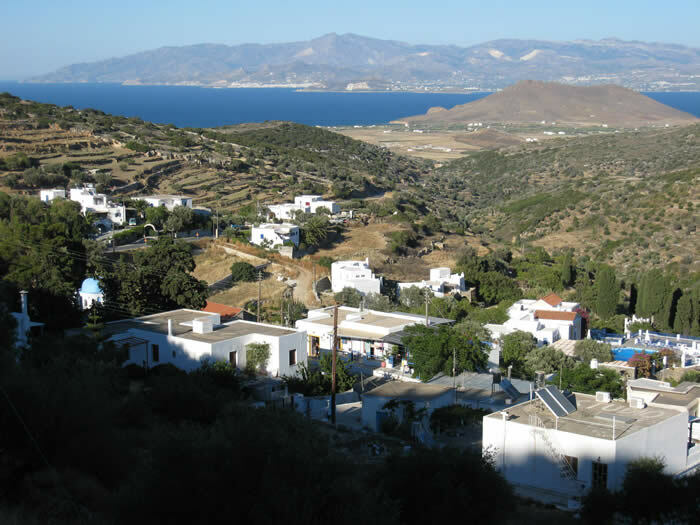 A little SE of Naoussa on the east coast facing Naxos, lies the hamlet of Ambelas, where you find signs of a slowly-awaking village with a gorgeous view across the straits to Naxos. In enchanting Lefkes, the island’s old capital, you will find no crowds, fascinating architecture and at least one decent restaurant in this often overlooked gem of a village. Right in the south near the water-sporting Golden Beach is Dryos, the perfect choice for a tranquil stay with enough beaches, tavernas and the odd shop to satisfy all but the hyper-active. 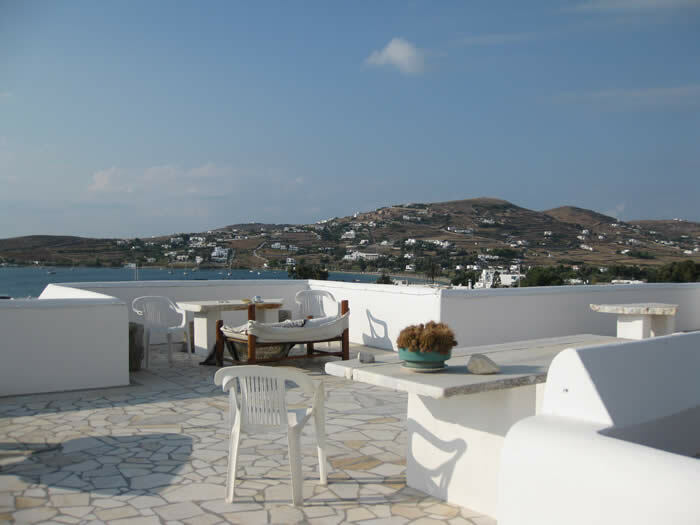 A road runs right round the coast of Paros and to circumnavigate it is rewarding – stunning panoramas across to neighbouring islands and plenty of attractive places for taverna stops. 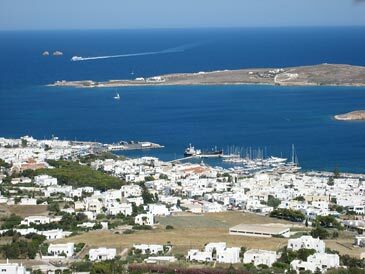 On the quite gentle slopes of the mountain which forms the island’s centre you will find Paros’s Valley of the Butterflies. Theoretically these creatures will be on parade from about May to August, unless they get tired of people shaking the branches they perch on to acquire the confetti effect. Walking to monasteries on the mountain slopes, panoramas from the mountain tops. 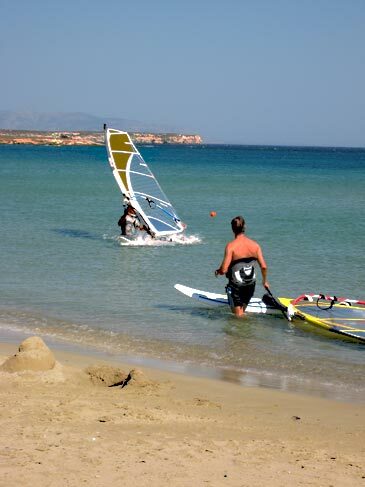 A variety of water-sports near Dryos in the SE and at Pounda in the W. Being a major shipping hub, it is easy to visit Naxos, Mykonos & Delos, Ios and Santorini. 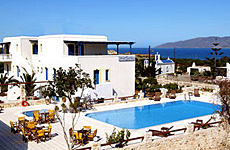 One of the most easily accessible islands in the Cyclades group. Tremendous charm of its [seaside] capital Paroikia and its former capital Lefkes and the historic area encircling the toy harbour of Naoussa. 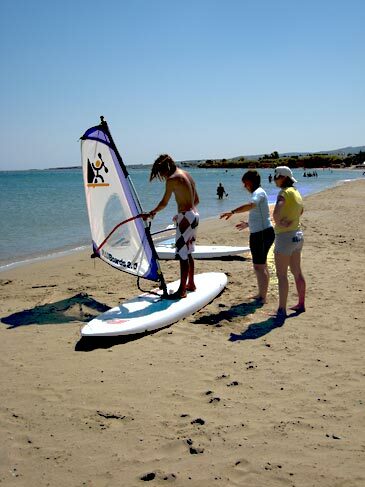 Many excellent beaches and water-sports. One might hope for less new building round the outskirts of Paroikia and Naoussa. There’s an unseemly traffic jam in Paroikia mid-morning and early evening when the ferries arrive in glorious procession – but you may find the bustle fun and the police trying to regulate it the chance for a quiet giggle. 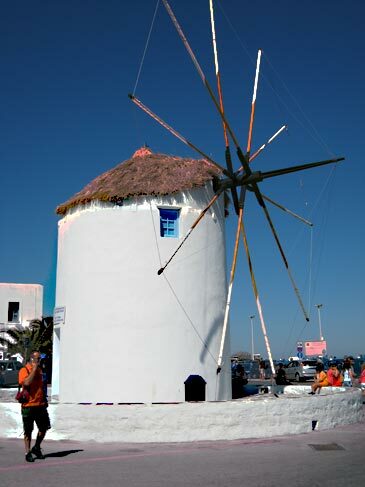 There are direct charters from Gatwick and Manchester on Fridays (and scheduled services on Thursdays and Sundays from Gatwick) to Mykonos, the best gateway for Paros. 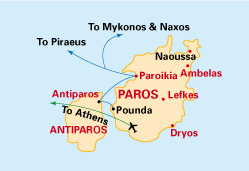 Alternatively you can fly on any day by scheduled flight to Athens and continue to Paros either by "connecting" domestic flight or, due to the increasing number of comfortable fast ferries from Piraeus direct to Paros; it's often quicker than waiting for the plane. The village of Lefkas from the pool. A gem set beside a large pool; every room is individually designed in island style. 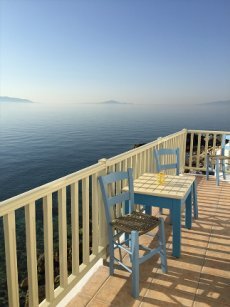 Breakfast (plus lunch and dinner optionally at least in high season) is taken on a terrace from which there is a breathtaking view to Naxos. Buses to the beaches of the SE and to town stop outside. A taxi to town (£5-ish) takes 10 minutes. Perfect for a pampered stay. Cat.A; air-con, mini-bar, phone. B&(buffet)B.
Lefkes Village Hotel with Naxos beyond. Another gem, right by the sea. Forty family-run rooms grouped round a large pool. The small private beach is a few yards down a path. Airy reception/dining area. Rooms excellently appointed. Cat C. Air-con, fridge, safe, sat TV, tel, veranda with SV; restaurant. B&(buffet)B. 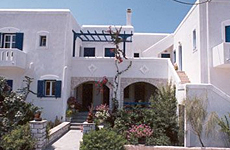 Eight studios in a quiet part of Paroikia, near the old town. Most rooms have balconies and there is a vast roof terrace from which you can watch your ferry leaving before actually missing it. Air-con. TV. S/C 2-4 pers. A family-run hotel at the picturesque fishing village of Ambelas. 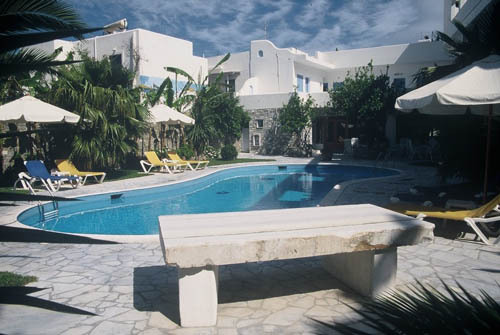 In unusually spacious surroundings the hotel has a large pool and is 200 metres from the sea. The refurbished accommodation is of a good standard. Pool, air-con, TV, hair-drier. S/C. Wheelchairs welcome. 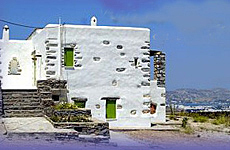 Renovated stone house on a hill-top 5km out of Paroikia. Stunning views over the town to nearby islands, wrap-round terraces, glorious seclusion and indoor plunge-pool on lower ground floor. Available year round; car essential. S/C (3 bedrms, 3 sh/wcs): 6 pers. 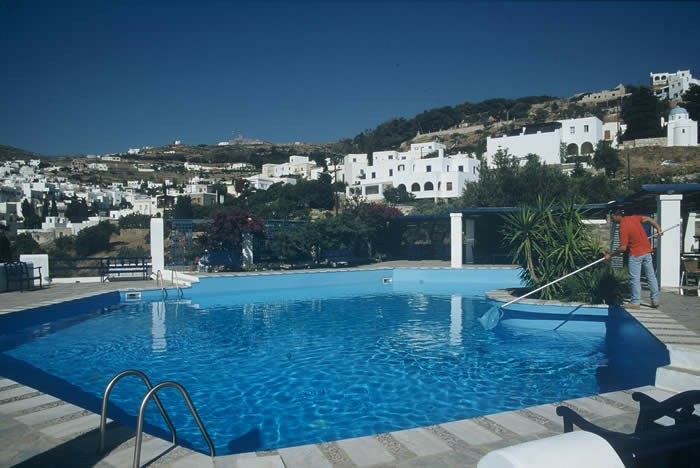 The Galinos has a free-form pool in flowery grounds behind the L-shaped hotel. The newly refurbished rooms all have a balcony and there’s a bar/breakfast room opening on to the garden and pool. 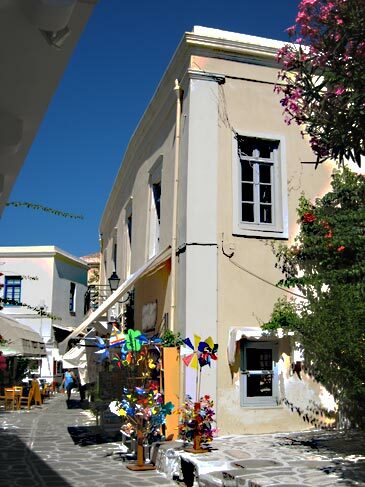 One of the town’s best tavernas is directly opposite and the narrow alleyways start within a hundred metres of the hotel. The rooms have huge balconies with fantastic views, a sun lounger as well as a table and chairs and are decorated to a high standard. Her mother even hand sews motifs on the bedding, fresh flowers in the room etc! She also has studios and apartments around 100 metres back from the port still mostly with views and very nice interiors, some family size as well as a sort of annexe attached to the building with 2 rooms, full kitchen even a washing machine! and its own terrace. The rooms above the harbour may be a little noisy in high season as they are above one of the best restaurants in Paros.